Another volume with lots of Yuki and little Tohru or Kyo. Much of this book focuses on Machi, Yuki's friend from school. Like the rest of the character in this book, her life has been a sob story. She's suspected of trying to kill her little brother. Not true at all. She adores her baby brother. Her parents are convinced that she's horribly jealous and is a monster of a girl. When they saw her placing a blanket over the baby, they assumed she was trying to smother it. It's interested that Takaya-san goes out of her way to villainize every parent in this series. The only adults that are portrayed positively are Tohru's mother and those adults without children. I wonder why. The second half of the book is about Rin. 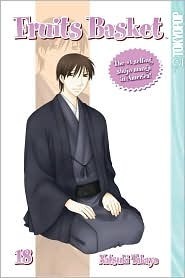 If Takaya-san was worried that the reader would pity Akito too much after his/her story was revealed in Volume 17, Volume 18 corrected that problem. Akito nearly killed Rin. He was furious that Rin had the gall to love Haru and that Rin tried to take his beloved treasure box. The end of the volume was fabulous. Tohru passionately declares her fear that Kyo-kun will be lost if the curse is not broken. Takaya-san does a great job drawing Tohru's anguish. That's really interesting that all the parents are portrayed in a negative light. I would think the author must have a personal reason for doing so? I'm not sure I like this Akito person after reading your reviews of these series. Glad it ends well though! I really need to re-read this series and watch the anime!